Historians give different explanations about Gandhi's attitude to the trial and execution of Bhagat Singh. 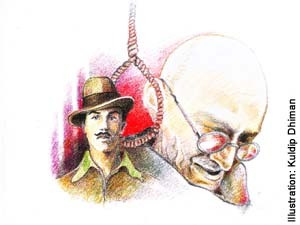 Some writers allege that Gandhi was not emotionally involved in saving Bhagat Singh's life from the gallows because of his obsession with his creed of non-violence and his repudiation of violent means, which Bhagat Singh had adopted for the fulfillment of his plans to wreck British power in India. Other writers argue that Gandhi did make desperate efforts to save Bhagat Singh's life till the end; and he failed, not for want of efforts on his part, but because the power to commute Bhagat Singh's death sentence lay not in his hands, but in the Viceroy Irwin’s. This study argues that the question of Bhagat Singh’s life and death has to be seen from a broader perspective, especially within the framework of the British Imperial system operating in the country, which is generally ignored. This study shows that Bhagat Singh and his associates were as much the victims of British imperialism as of Gandhian politics. In the late '20s and early '30s of the last century, Gandhi regarded Bhagat Singh’s mode of militant nationalism, and the extreme left-wing political activity as the most injurious to the cause of Indian independence. As a strategist he appropriated the positive features of both the approaches and made them with some modifications an integral part of the Congress policy and programme, which he presented later at the Congress session at Karachi, about a week after Bhagat Singh’s execution. The issue of Mahatma Gandhi’s attitude to Bhagat Singh’s trial and execution has sparked much controversy among historians and writers. Some writers allege that Gandhi could have saved Bhagat Singh’s life if he had wished, but regrettably, he didn’t and wouldn’t, and his failure in saving Bhagat Singh’s life from the gallows leaves a black spot on his political career. On the other hand, Gandhi’s own party workers, followers and some writers clarify with pathetic earnestness that Gandhi failed not because of his lack of interest in the well-being of Bhagat Singh, but because of the circumstances which lay beyond his control. I think that this controversy, which has stimulated much literature on the subject, needs further clarity and understanding. Let us first see how historians and other writers — this is not an enumeration, but an exemplification — view and explain Gandhi’s attitude to the trial and execution of Bhagat Singh. 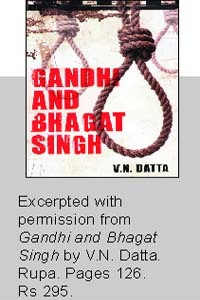 In Chapter fourteen ‘Gandhi’s Truth’ of his book The Trial of Bhagat Singh, A.G. Noorani maintains that Gandhi’s efforts in saving Bhagat Singh’s life were half-hearted because of his failure to make a strenuous appeal to the Viceroy for the commutation of his death sentence to life. To emphasise his indifference to the fate of Bhagat Singh, Noorani writes that Gandhi did not care to see Bhagat Singh when he was on hunger strike in jail. 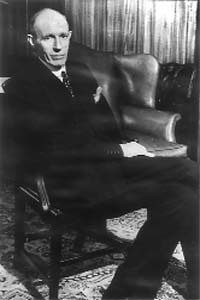 Noorani asserts that during his conversations with the Viceroy, Gandhi pleaded not for the commutation of Bhagat Singh’s death sentence, but for its suspension. Contesting A.G. Noorani’s views as expounded in his book, Anil Nauriya asserts that falling short of making the commutation of Bhagat Singh’s death sentence a part of his pact with the Viceroy, Gandhi did whatever he could to put the maximum pressure on the Viceroy not to hang Bhagat Singh. Nauriya also highlights that Gandhi had sent Sir Tej Bahadur Sapru, M.R. Jayakar and Srinivasa Sastri to the Viceroy to plead for the commutation of Bhagat Singh’s death sentence. Joining the debate, Prem Basin, a well-known left-wing politician, repudiates D.P. Das’ charge that Gandhi was devious and untruthful in his negotiations with the Viceroy. Recently two publications came out on Bhagat Singh, the first by S. Irfan Habib, To Make the Deaf Hear: Ideology and Programme of Bhagat Singh and His Comrades: Three Essays, and the second by Kuldip Nayar, Without Fear: The Life and Trial of Bhagat Singh. Habib’s comprehensive and lucid study focuses on Bhagat Singh’s ideological orientation, which is summed up in Chapter four of his book entitled Ideology and Programme of the Hindustan Socialist Republican Association. His study shows that Gandhi was hostile to Bhagat Singh’s use of violence in the realisation of his aims. But on the question whether Gandhi tried to save his life or not, Habib is somewhat nebulous. Of course, Habib emphasises that some of the young Congress leaders, like Jawaharlal Nehru and Subhas Chandra Bose were not only sympathetic, but willing to help Bhagat Singh. On Gandhi’s attitude towards Bhagat Singh’s death sentence, Nayar reiterates his earlier view that Gandhi was concerned about saving his life, which is evident in the Gandhi-Irwin correspondence; but he did not wish to identify himself with the revolutionaries because that would negate his stand. The assumption that Gandhi and Irwin were sovereign shapers of events is questionable. Things happen differently in the historical realm. Gandhi and Irwin were not the repositories of power because they were working under constraints, which set limits to their actions. The question is whether the Viceroy and Gandhi had the choice, and elbow room for manoeuvre and dexterity of manipulation to decide on their own the question of Bhagat Singh’s death sentence. It has been argued in this work that despite his firm commitment to non-violence, which remained a cardinal principle of his life, Gandhi put the maximum pressure on the Viceroy Lord Irwin for the commutation of the death sentence of Bhagat Singh and his comrades. Gandhi disapproved of their action. In this study, Gandhi’s attitude to Bhagat Singh and his associates' death sentence has been examined against the background of his negotiations with the Viceroy for the settlement of outstanding political issues facing the country. Irwin had established a rapport with Gandhi, and held him in high esteem for his integrity of character. Gandhi, too, respected Irwin for his candour and goodwill. Despite a general view prevalent in historical studies on Bhagat Singh that Gandhi and Irwin could on their own commute Bhagat Singh’s death sentence, this study shows that the issue of saving his and his comrades’ lives lay beyond Irwin and Gandhi, because they were not free and independent enough to do whatever they wished as is commonly assumed. Gandhi’s critics have argued that he could have made the commutation of Bhagat Singh and his comrades’ death sentence a condition for signing the Gandhi-Irwin Pact. But how could he do so since such a course would have been contrary to his own ethics and also to the policy of the Congress? Hence there was no question of his terminating his truce with the Viceroy, nor could he undertake a fast unto death for compelling the government to reduce Bhagat Singh’s death sentence to life imprisonment. Possibly he could have rallied a wide public support for the abolition of capital punishment in principle. Gandhi thought that Bhagat Singh was a ‘misguided youth’, who had gone wrong. The British considered Bhagat Singh a rebel and a criminal, who must be hanged. The liberals, who advanced India’s cause of self-government through constitutional means, reproached him for his disorderly conduct. The hunger strike undertaken by Bhagat Singh and his comrades in jail had aroused widespread sympathy for them in the country. When they were charged with the crime of Saunders’ murder, they began to be perceived by the public as freedom fighters who were dying for the love of their country. When they were executed, the nation turned them into ‘martyrs’. Nehru was absolutely right when he wrote movingly that Bhagat Singh became a symbol and remained so. Yes, a symbol he remained, just a name to be conjured, a name to be remembered, and paid tributes on his birth and death anniversary ritualistically. In our national historiography he is barely mentioned, and generally relegated to a footnote; and treated, of course, as an outsider, a deviant, and a maverick, and not a valiant co-partner in the mainstream of the Indian freedom movement. Such are the turns and twists of history! The tragedy of Bhagat Singh and his comrades was not that they were idealists in the path of the deterministic juggernaut represented by the British Imperial system, but their schemes and programmes might have been realised had the Congress and other political parties, and the country, not chosen other paths. They were as much the victims of Congress politics as of the British Imperial system. This writer has reasons to believe that though Bhagat Singh had challenged the Gandhian political morality, Gandhi, despite his disapproval of Bhagat Singh’s action, regarded his sacrifice a patriotic one, and Gandhi would not mind many Bhagat Singhs dying for the freedom of the country and sacrificing themselves. Didn’t the Mahatma too sacrifice all he had for the country? A sacrifice never goes in vain! There is a great lesson to be learnt from ‘constructive destruction’. A flower must die to yield its place to the fruit, and flower must perish for the seeds to sprout again. The cycle of history carries on.